The City of Nagoya gained membership in the Creative Cities Network (in the category of Design) under the patronage of the United Nations Educational, Scientific and Cultural Organization (UNESCO) in October 2008. The Creative Cities Network is certified by UNESCO, an organization which emphasizes the conservation of cultural diversity. This program promotes international partnerships and reciprocal exchanges between cities throughout the world which seek invigoration through the development and strengthening of creative and cultural industries. The program consists of seven fields which include, craftwork and folk art, design, film, gastronomy , literature, music, and media arts. Nagoya proclaimed itself a ‘Design City’ in 1989. The inspiring announcement by the Nagoya City Assembly touched our citizens and imprinted itself on their memory. It has been a focus of our municipality ever since, encompassing 3 areas: community building, product manufacturing and the cultivation of human resources. Design is synonymous with humanism, a philosophy that aims to achieve lasting peace by combining activities directed towards a new way of life, human wisdom, and techniques / technologies that have been evolving since antiquity. In 1989 we celebrated the municipal government’s centennial anniversary. We had risen from the ashes of the war and recovered from the heavy losses of the Ise-Bay Typhoon, an unprecedented natural disaster that hit our region in 1959. After enduring all of these hardships, we discovered humanism’s expression in design. And in order to respond to our citizens’ hopes for lasting peace, we resolved to put faith in design as a powerful agent in community building, and share our experience with the world. history, culture and resources of our “urban community”, in addition to those that support it and the creative power of humanistic design, the district centered in Nagoya now thrives as one of the world’s great nuclei of manufacturing. Our area accommodates a number of important businesses, including one of the world’s foremost automobile companies that started up in our neighboring city. These companies have been making steady progress by taking the time, effort and ingenuity needed to enhance creativity. They are very happy and proud to have contributed to the world’s culture and economy, transcending geographic boundaries. 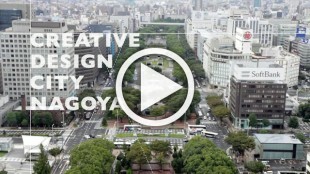 Nagoya believes in the power of design to help realize a sustainable society where diverse cultures coexist in harmony. We wish to utilize the rich creative resources of our ‘Design City’, in cooperation with other like-minded cities at home and abroad, to serve a world where people respect each other and live together harmoniously. We agree with the intent and purpose of UNESCO’s Global Alliance for Cultural Diversity and we are grateful to become a member in UNESCO’s Creative Cities Network of Design.